Well here it is, this is my new sewing room / studio for messy jesse. It's the perfect craft space, with lots of shelving and storage for my growing fabric collection. A new addition to this room is a wall-mounted TV over my desk yippee! Note the victorian fireplace I painstakinly restored for DAYS! I haven't got a proper picture of it before I started on it annoyinly, but it was covered in a ultra thick layer of cream paint which I stripped down using nitro mors solution and a little metal scraper, hopefully won't have to do that again : I My trustee expedit holds my sewing books and my prized collection of Golden Hands encyclopedia's (mentioned in a previous post here). As well as lots of papercrafting bits and bobs. 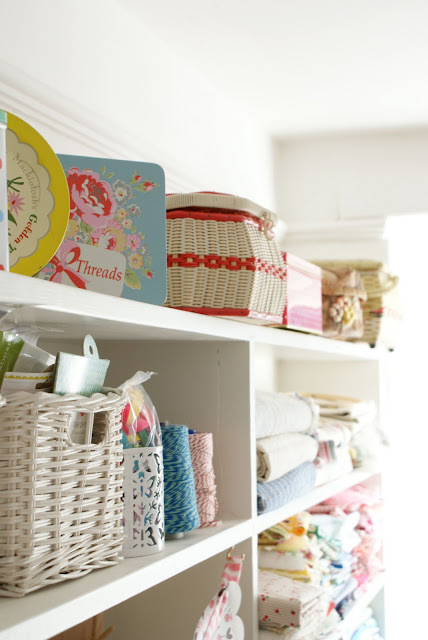 The ladder shelves house an array of sewing notions, threads, trims and paper patterns. I'm still working on this part, I'd quite like to have more of these things on show but I'm not sure how to work this yet. I've got a new desk by upcycling the old kitchen countertops we ripped out downstairs. It's so sturdy, and a great neutral colour for the room. My old desk from IKEA bowed with the weight of my sewing machine so hoping this won't do the same? And the crowning glory... the fabric collection! I've arranged it with vintage sheets, curtains and pillowcases on the bottom four shelves and modern fabric on the two shelves above that, then fat quarters all arranged my colour, topped off with some larger yardage peices including some beautiful linen I brought back from Turkey on a holiday this year (going to be turned into a couple of sofa cushions). Some CK fabric, and a stack of vintage emroidery bits and bobs I've been collecting from charity shops this year. Haha my scrap bucket! what a disaster it looks but it actually works quite well for me. I need my scraps relatively easy to get to and not too tidy where it takes me forever to tidy. 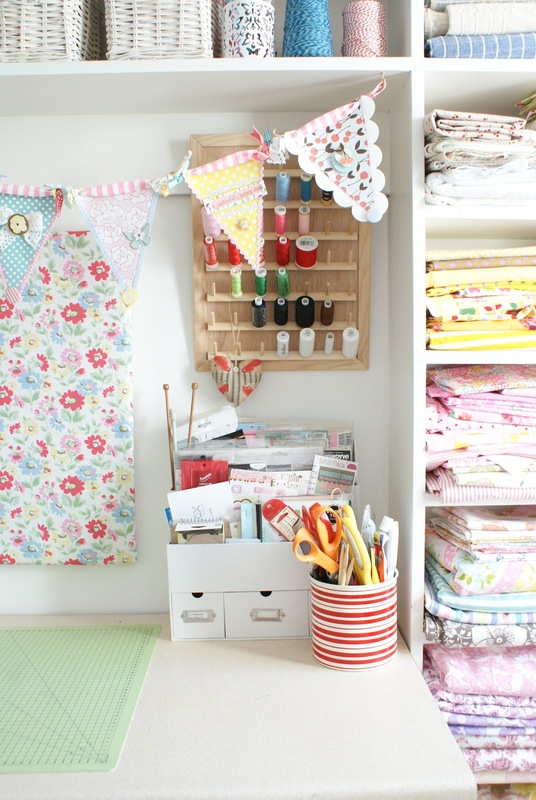 Do you have any good scrap organising tips? though I'm hoping to clear alot of it in the new year with some scrap-busting projects. A shelf of my vintage sewing baskets and tins store less-frequently-used items, like press studs, zips, alphabet stickers, and button poppers. Hmm have I missed anything out, let's see: deer ornament collection over the mantelpeice, vintage Singer sewing machine and spools of bakers twine = my perfect studio. I AM SO ENVIOUS!! What a gorgeous room. Congratulations and exquisite job! That is AMAZING!! What an utterly lovely space to have, well done! 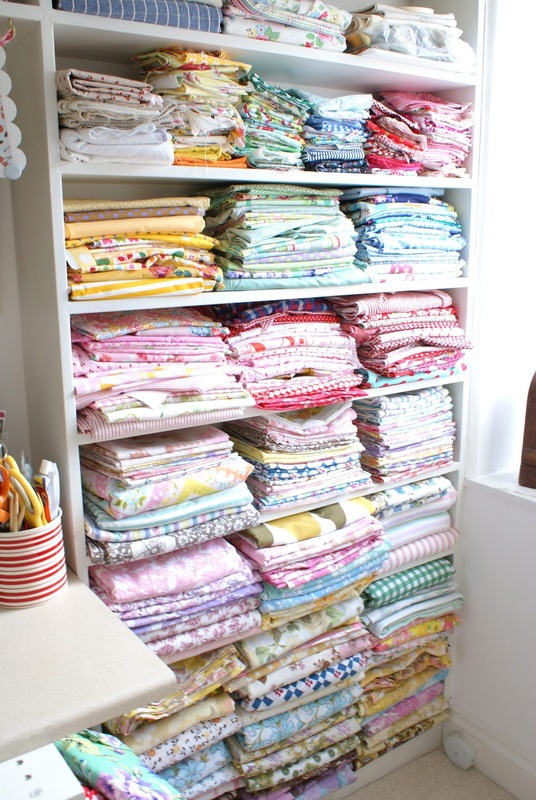 I am *green* with envy over your fabric stash!! Can you tell me what typr of sewing machine that is? What an amazing space! Love it! Yet another reason I need to quit being lazy and paint my room white. Looks so much cleaner and fresher! this is so pretty and bright! I know you will create lots of beautiful things here Jesse! Lovely, what a great job you've done. Makes me want to paint stuff white! 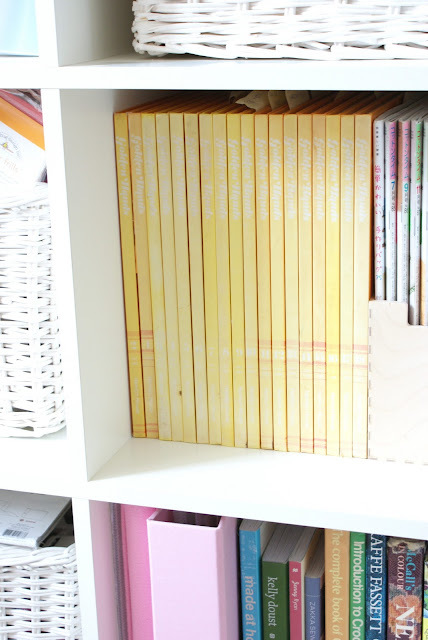 Wauw, you are well organized. 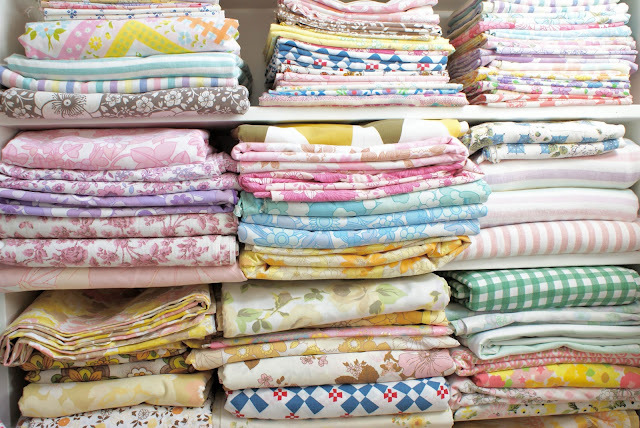 I love your collection of vintage sheets. Such a beautiful studio! I love the white so that all the pretty fabrics become the center of attention! I am also loving your little 'mug rugs'... I wouldn't mind having a go at one of those! 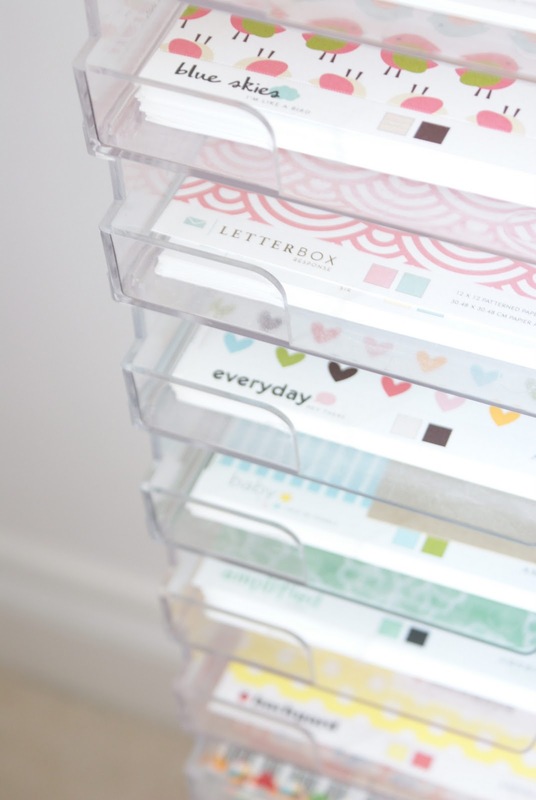 Wow - I just found your blog, and absolutely love it! 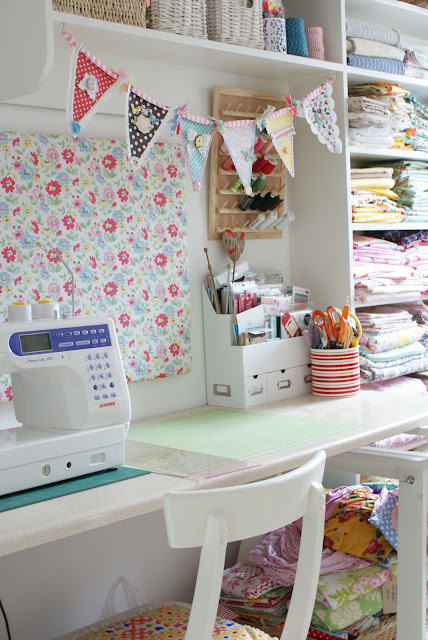 I'm so jealous of your beautiful craft room, and all your lovely fabrics!! I will become a follower as soon as I can, but it seems to be playing up at the moment. Absolutely in love with your room!!! 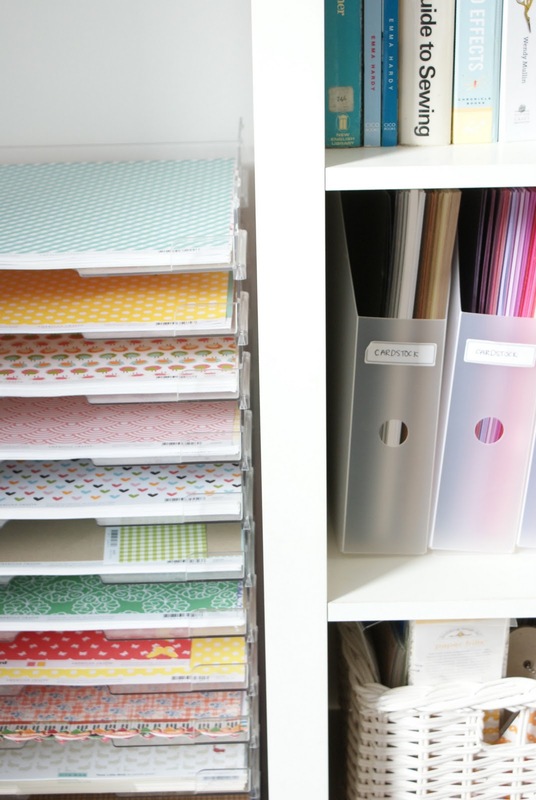 So sweet and pretty and organized. Enjoy! So wonderful, I love everything about this room. I think I'm pretty organized but this is just perfect! What a wonderful room! And all those pretty fabrics!! Wow!! What a beautiful room, I'm so jealous! Lovely, love the pretty paper, where did u get it! This place is the paradise! Completely in love with it. I wish I had one on my own. I will, someday. wow! it's amazing jesse!! i love how you painted everything white....it makes all the colors pop, plus probably makes it feel bigger. really cute!! I keep my scraps in the 12x12 clear scrapbooking envelopes. I get packs of 12 at Michaels for $4-6 with a sale and coupon. 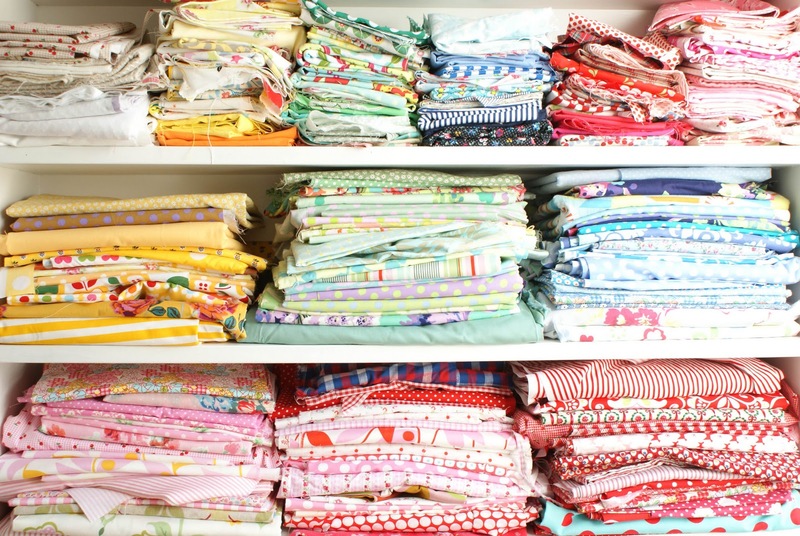 I categorize by color for cottons or each project's remnants if I have a lot of whole pieces with cuts out of them that won't go back on a bolt (mostly speciality fabrics like satins with their matching linings after making a dress). They'll either file in a bucket or drawer or sideways on a bookshelf and you can still see color at a quick glance because the envelope is clear. I'm curious as to how your fabric stash is doing so close to the window with no light protection? Do you move through your fabrics quickly so you don't have to worry about fading? 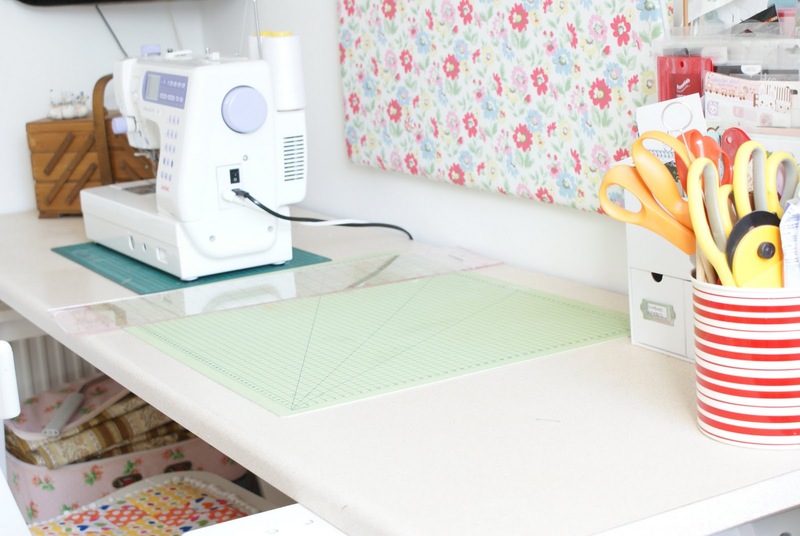 I am not nearly as experienced at sewing as you are, but I too am working on my own home studio/office/craft room and I adore these pictures. Thank you so much for sharing!! Would you mind telling me where you found your adorable tins, and the wallpaper? Lovely space!! !